TOKS NEO is distinguished not only by exceptional conditions created for passenger comfort and entertainment packages, but also by highest and stringiest requirements for the ecology. This is a new service standard for travelling much more comfortably. 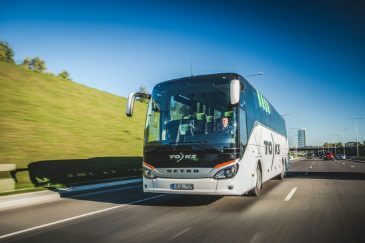 Brand new, modern, German brand SETRA TOKS NEO buses ride the roads of Lithuania. 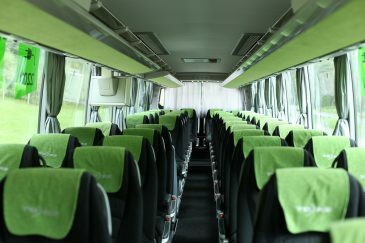 The modern media center the buses are equipped gives the opportunity for the holders of smartphones, tablets and laptops to use the constantly updated entertainment package specially designed for these buses. Media center offers passengers recorded music, the latest movies and magazines in different languages, a comfortable Internet browsing. When connected to the media center, it becomes possible to track your own journey based on GPS coordinates, to see the distance traveled and kilometers and time remaining to the destination station. It is also possible to plan your next journey, choose alternatives for easy bus interconnections. Connection to the media center with your devices is possible during the entire journey. This center hosts entertainment packages that are free of charge and accessible to all the bus passengers. During the journey, do not worry that your device will discharge – there are electrical sockets next to each seat which will allow using the computer freely. The individual seats and comfortable, chess arranged chairs with individual tables create the perfect atmosphere of relaxation, which can be used for work during the journey. Want to purchase a ticket on the bus, but don’t have the cash? Not a problem! 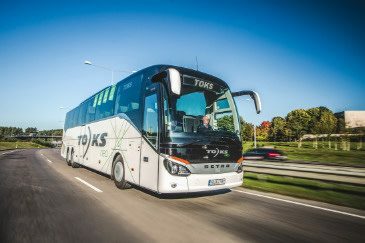 TOKS NEO buses accept bank cards. Bright and spacious cabin of the bus not only allows getting comfortable in your spacious seat, but also laying aside your hand luggage.